There are a number of different medals that could be awarded for service in the Great War and many people will have the medals of family member who served. If you have the medals of a man of the 9th King's this page is intended to provide a brief explanation of what those medals are and why he received them. It is not the case that every man who served in the 9th King's Liverpool Regiment in the Great War would have been entitled to medals. Each medal has criteria which must be met before they can be authorised for issue to an individual. Instituted in 1917 for service ashore in France and Flanders between 5 August and 22 November 1914. In 1919 a clasp bearing the above dates was authorised and given to those individuals who had actually been under fire between the prescribed dates. The 9th King's did not serve overseas until March 1915 so any 9th King's officers or men with this medal must have served initially with another unit. On the reverse of the star, the name, rank, number, battalion and regiment of the servicemen is stamped. In the case of an officer, name and rank only are shown. Authorised in 1918, the 1914/15 Star was awarded to those individuals who saw service in France and Flanders from 23 November 1914 to 31 December 1915, and to those individuals who saw service in any other operational theatre from 5 August 1914 to 31 December 1915. On the reverse of the star, the name, rank, number and regiment of the servicemen is stamped. Unlike the 1914 Star, the battalion number is not stamped on the 1914-15 Star. In the case of an officer, name and rank only are shown. The British War Medal 1914-1920, authorised in 1919, was awarded to eligible service personnel and civilians alike. Qualification for the award varied slightly according to service. The basic requirement for army personnel and civilians was that they either entered a theatre of war, or rendered approved service overseas between 5 August 1914 and 11 November 1918. The number, rank, initial(s), surname and unit are stamped into the rim of the medal. In the case of officers, rank, initial(s) and surname will be found. The Victory Medal 1914-1919 was also authorised in 1919 and was awarded to all eligible personnel who served on the establishment of a unit in an operational theatre. The Territorial Force War Medal 1914-1919 was awarded to members of the Territorial Force only. To qualify, the recipient had to have been a member of the Territorial Force on or prior to 30 September 1914, to have signed (prior to that date) the voluntary agreement to serve overseas,and to have served in an operational theatre outside of the United Kingdom between 5 August 1914 and 11 November 1918. Also, if he qualified for either the 1914 Star or the 1914-15 Star he was not eligible for the Territorial Force War Medal. These conditions mean that the TFWM is relatively rare, there being only eight issued to officers and men of the 9th King's. The DSO was intended to reward commissioned officers below field rank for distinguished service in time of war. The medal was issued un-named. The MC was instituted shortly after the outbreak of the Great War as a gallantry award for junior officers and warrant officers. The medal was issued un-named but the recipient often had his details inscribed on the reverse. The ribbon was white with a central purple stripe. This example has faded with age. The DCM was a gallantry award for other ranks, second only to the Victoria Cross. It ranked above the Military Medal. The number, rank, initial(s), surname and unit are stamped into the rim of the medal. Officers were not eligible for this medal, but it was awarded to men who were later commissioned, so it is possible for an officer to possess a Distinguished Conduct Medal from earlier in his service. The MM was awarded to NCOs and men of the Army for individual or associated acts of bravery not considered of sufficient gallantry to merit the award of the DCM. 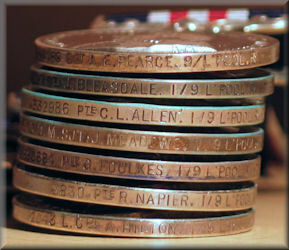 The number, rank, initial(s), surname and battalion (with the battalion number) are stamped into the rim of the medal. Officers were not eligible for this medal, but it was awarded to men who were later commissioned, so it is possible for an officer to possess a Military Medal from earlier in his service. The MSM could be awarded to non-commissioned officers for distinguished or meritorious service and, from January, 1917 it could also be awarded for individual acts of gallantry performed when not in the face of the enemy. The number, rank, initial(s), surname and battalion are stamped into the rim of the medal. Officers were not eligible for this medal, but it was possible to be commissioned from the ranks, so it is possible for an officer to possess a Meritorious Service Medal. Instituted in 1894, this medal was awarded for 20 years service in the ranks. Officers could also receive the medal, being eligible on account of their non-commissioned service. This medal was superceded by the Territorial Force Efficiency Medal in 1908. The Territorial Decoration was a long service award for officers who completed 20 years commissioned service. Service in the ranks counting half and war service counting double. It was superceded by the Efficiency decoration in 1930. They were issued un-named. A long service award for service in the Territorial Force and its predecessor, the Volunteer Force. It was granted for a minimum of 12 years service. It was superceded by the Territorial Efficiency Medal in 1921 when the Territorial Force was renamed the Territorial Army. This medal is sometimes seen with a slightly different ribbon, with a yellow stripe down each edge and none down the centre. The number, rank, initial(s), surname and unit are stamped into the rim of the medal. Officers were not eligible for this medal. Granted for a minimum of 12 years service in the Territorial Force/Territorial Army. It superceded the TFEM (above) when the Territorial Force was renamed Territorial Army. This medal was itself superceded in 1930 by the Efficiency Medal. This medal was awarded to men of the Regular Army who had completed eighteen years service and whose conduct was exemplary. As it is a Regular Army award it was not available to members of the Territorial Force, so it is a rare medal to the 9th King's, being awarded only to 'Regulars' who served some of their Army career with the 9th. The number, rank, initial(s), surname and unit are stamped into the rim of the medal. Commanders-in-Chief in the field submitted periodical lists of officers and soldiers who were "mentioned in despatches". A Mention ranked below the Military Cross or Military Medal and could be for gallantry in action or for a wide range of services on and off the battlefield. The emblem representing a Mention in Despatches is a small bronze spray of oak leaves which was worn on the ribbon of the Victory Medal. All of the Allied nations during the Great War, as a gesture of goodwill, presented a number of their own awards to their allies to be distributed amongst the various armies. The following awards were made to men of the 9th King's. 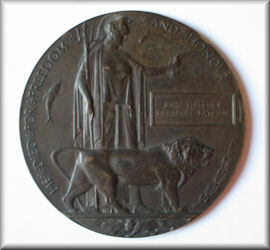 Cast in bronze, these were issued to the next of kin of those who died whilst serving or who died as a consequence of their service in the Great War. Known commonly as 'Death Pennies' or 'Death Plaques'. Each one was individually named. This badge was awarded to members of the Territorial Force who signed the Imperial Service Declaration indicating their willingness to serve overseas if required. As members of the Territorial Force their conditions of service meant that they were committed to serving in the UK only unless specifically volunteering to serve overseas. It was worn in uniform over the right breast pocket. Whilst not a medal, the Silver War Badge is often seen amongst family 'bits and pieces' from the Great War. It is sometimes incorrectly called the Silver Wound Badge. 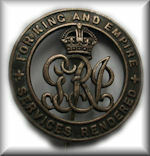 It was authorised in September 1916 and takes the form of a circular badge with the legend "For King and Empire-Services Rendered" surrounding the George V cypher. The badge was awarded to all of those military personnel who were discharged as a result of sickness or wounds contracted or received during the war, either at home or overseas.Each badge is numbered on the reverse and this number can be checked against the master roll held at the National Archives for the name of the recipient.